Comparable effects against anxiety and insomnia to those of benzodiazepines. May reduce inflammation and relieve pain. Baicalin is a polyphenolic compound and flavone, part of the large family of flavonoids. Isolated from various species of the plant scutellaria, it has primarily been used in Chinese herbal medicine - where it is known as Huang-chin (Scutellaria baicalensis) - either on its own, or in synergy with other herbs such as in Sho-Saiko-Ti, a well-known liver cleanser. Its calming, relaxing and rebalancing properties at an emotional level are comparable with those of L-theanine and Picamilon – indeed, at precise doses, baicalin can be taken in conjunction with these substances. Baicalin has a positive effect on all sleep-related problems and is a good alternative to today’s over-prescribed sleeping tablets and benzodiazepines. It has anxiolytic properties but without inducing a sedative effect. It can be used in isolation, where its activity is similar to that of GABA or Pharma GABA, but in those with long-term insomnia, it can also be combined with low-dose melatonin or magnolia extract with which it shares certain antioxidant properties. Baicalin has an anti-inflammatory effect on joints, supplementation helping to relieve arthritic joints, such as the hips and knees (gonoarthrosis). It is an excellent substitute for NSAIDs or conventional pain-relieving drugs which are known to have significant and cumulative side-effects. It also helps reduce inflammation in bronchial complaints or allergies affecting the sinuses and promotes easier, deeper breathing. Baicalin delays certain processes associated with ageing through its effects on cellular energy. We know that a cell divides approximately five times before dying and that, as recent studies show, this cell death is linked to telomere length. If a cell does not receive nutritional or other elements, it will enter a state of senescence, before dying via apoptosis (programmed cell-death). We can thus see how in older people, internal organ function declines due to inadequate energy supply. Baicalin has been shown to be effective at preventing such processes, so extending the life of various vital organs. A number of treatment protocols have been established by doctors and phytotherapists to gain the maximum benefit from these properties. • a possible effect against alopecia through its action on hair follicles. To date, only topical application of a baicalin solution has been tested but it is theorised to confer an anti-androgenic effect via one of its ingredients, a protein called TERC, which protects against ageing and erosion of dermal tissues, and enables keratin to be produced. 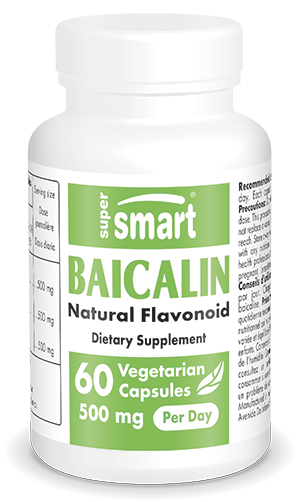 With no undesirable side-effects, an average daily amount of 500mg of baicalin can be taken in one or two doses. The only possible contraindication is in the case of surgery with general anaesthetic in the week before taking baicalin. adults. Take 2 capsules a day. Each capsule contains 250 mg of baicalin.